Have you ever considered volunteering for the Essex Wildlife Trust? Volunteers get access to incredible behind the scenes experiences, learn from our knowledgeable staff and encounter Essex’s Wildlife on an up close and personal basis. There is a real variety of volunteering roles available. Evidence suggests that volunteering generally helps to reduce stress, increases confidence and benefits mental health. Volunteers out on wildlife reserves combine these benefits with those of being outside. 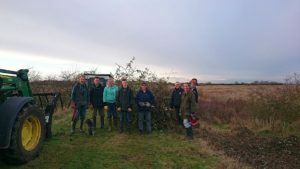 Essex Wildlife Trust volunteers are all different ages and some volunteers have been with the Trust for over 20 years whilst others have only just discovered it. “We contacted the EWT to enquire about our son doing the volunteering aspect of his Duke of Edinburgh award at one of the reserves; I knew it would be something he would enjoy. I was put in contact with Jonathan, the Warden at our local reserve and it was all arranged. We then thought rather than just drop our son off for the day once a month to volunteer, my husband and I decided we’d like to do it too. We have now all been on 3 volunteer days at the reserve and have been made to feel very welcome by everyone. It is great to see what can be achieved in a day with big areas of scrub cleared but also get fresh air, have a free work-out and also see many wetland birds coming and going”. EWT have reserves and visitors centres that need volunteer help across the county of Essex. To find out what is available near you carry out a search using your own postcode and choose interests such as ‘environment’ and/or ‘wildlife and animals’ and activities such as ‘gardening‘ or ‘practical skills’. You can also contact your local volunteer centre for further information.